CIM was only two weeks ago, although it feels like months have passed between CIM and today. I've been taking a much needed break from pretty much everything, and I waited ten days to run again. Between training and fall racing I was feeling pretty burned out so the break has been very welcome in my life. While not training or really working out at all, I've enjoyed the time to hang out with friends. We ventured to SF last weekend for my work holiday party and had a fantastic time. The food at the party was great, especially because they had broccoli au gratin and pesto pasta. Strange party highlight? The popcorn machine in the movie theater below our venue caught on fire, and we got evacuated temporarily. Outside for a bit due to a fire drill in the party building. Oops. Android shaped gingerbread cookie - yum. Documenting that I did, indeed, wear heels. We stayed in the city after the party and conquered some Christmas shopping on Sunday. After shopping we headed to a new craft brewery find in SOMA called Cellarmaker. 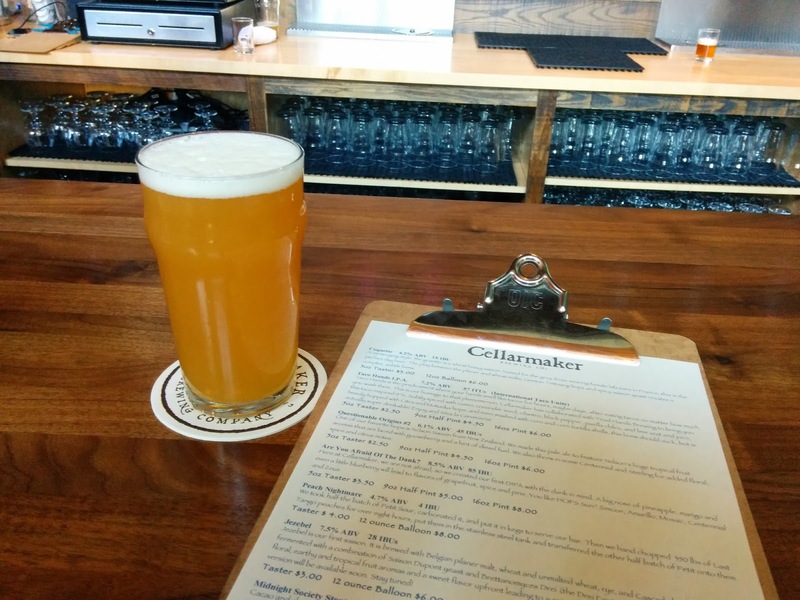 We loved the beer and the atmosphere; I highly recommend checking it out if you are in the area. One beer, Tacohands IPA, is actually spiced like tacos. As weird as it sounds, it is really, really good. I was involved in two Secret Santa gift exchanges, one with Oiselle team and one with SF Marathon Ambassadors. It's been ages since I've done a secret santa exchange and it was so much fun to get unknown gifts. My SFM Santa sent Specialty's cookie mix - YUM! I still don't know who that Santa is. My Oiselle team santa, Mary from Florida, sent a cat fabric handbag that she made herself. It's super cute, and I'm impressed by her talents! 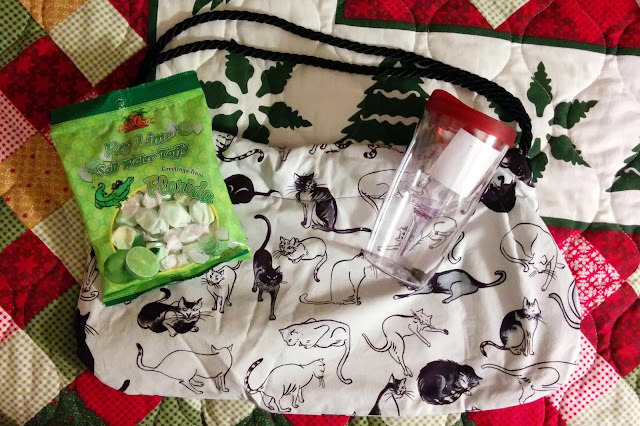 Florida taffy, cat handbag, and wine travel/camping cup. Love it all. 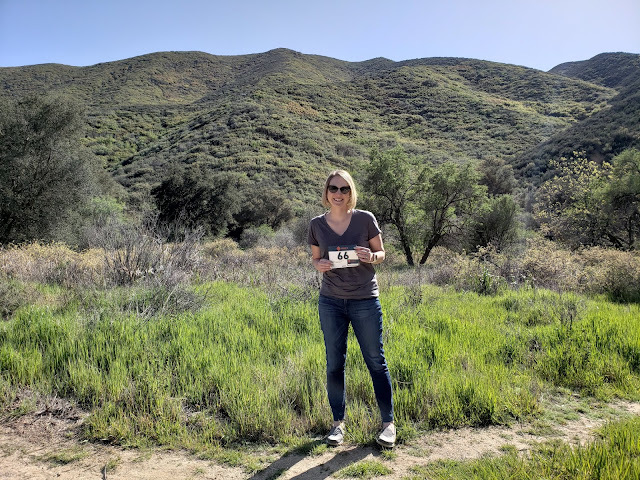 Fast forward to this weekend, which kicked off with a trail run at Quicksilver County Park in San Jose. Being the directionally challenged couple we are, Kevin and I managed to mess up the route pretty badly and ended up running 14 miles instead of 8.5. Unfortunately, turning the wrong direction on New Almaden trail takes you way the heck out of the way from your car. Good to know. I was still ecstatic to be back out on the trails for the first time after twisting my ankle, but admittedly 14 miles was more than I was ready for yesterday. 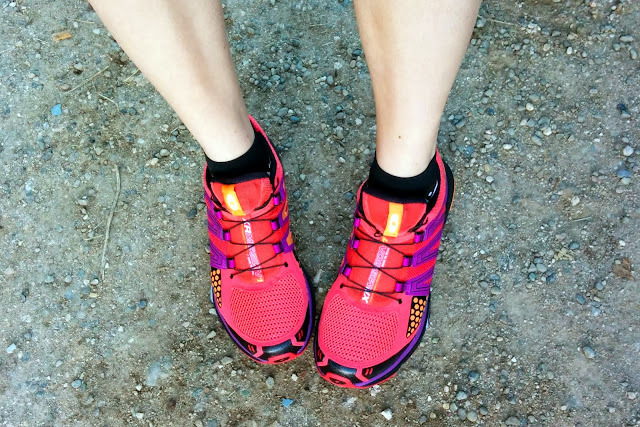 I was also trying out new trail shoes, again not ideal to do on a long run. On the bright side, we ran a lot of Randal trail and the entirety of New Almaden trail and loved both of them. Plus (thank goodness for small favors) my shoes were awesome. Documenting clean new trail shoes, the Salomon XR Mission. I love these reddish-colored trees. We closed out this weekend with more fun times in SF, dinner and drinks with friends, brunch at Blue Bottle Coffee, and more shopping. This week we are heading to Ohio for a few days to visit family and I can't wait to see everyone. Merry Christmas all! I'm jealous! I need some trail in my life soon :) PS - Your dress for your holiday party is gorgeous! 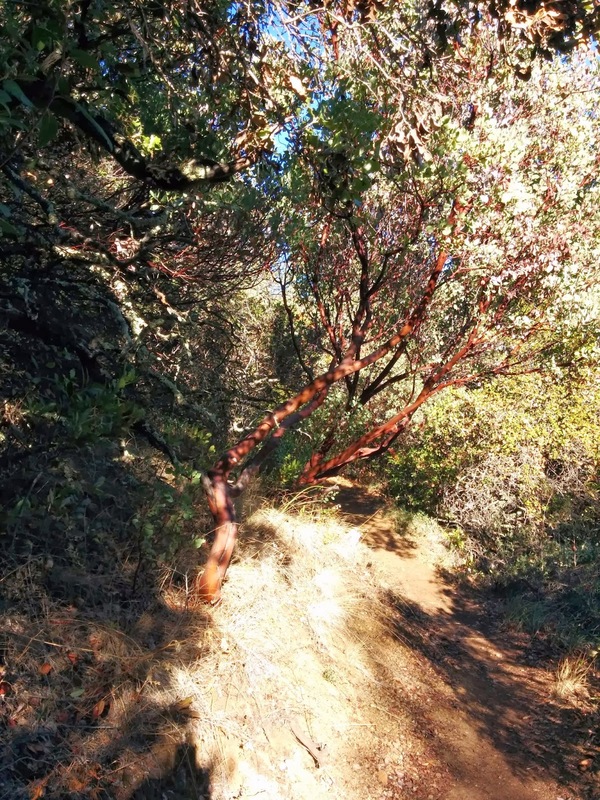 I think those reddish colored trees are Manzanita. Hope you have a great time in Ohio! Merry Christmas! !